We would definitely stay there again Liked to thank the desk staff in assisting us in getting our boarding passes for us . Balcony view, unfortunately the outdoor seating was not very comfortable and was older and rusted. Reply from General Manager: We apologize for the patio furniture not being comfortable and for any inconvenience this may have caused. We appreciate your feedback, we have replaced the patio furniture and hope you will return and enjoy the new set. Checking in & out was simple & efficient! Employees were out & about all the time caring for the pool & grounds. They were helpful but not intrusive. We loved our stay at SW! Our 5th floor view of the gulf & beach was amazing. The sunrises & sunsets were breathtaking. Even the storm was mesmerizing! 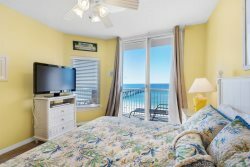 Our condo was clean, well-furnished & the location in Navarre was excellent. Thank you. The team members have been friendly and very helpful. We have enjoyed our stay very much so far and will be here until the middle of March. I found your team very helpful, I called several times, and they were always polite, very informative and accommodating. We absolutely loved Navarre Beach. I loved the pier, I went to the pier everyday just to see the catch of the day, and to see what might be swimming around. I loved gathering seashells. I found a sharks tooth. That was like finding gold to me. ;;)) I will be back and can't wait to take family and friends with me. I also loved the fact that Pensacola and Destin is so close.. love, love, loved it..
From the moment we arrived, your staff was helpful. We got there early, and they helped us get checked in early; this was most appreciated. We had a couple of issues with the TV and Internet which were solved immediately by your maintenance staff. The beach house experience was amazing. The space and view of the ocean were amazing. The space makes it hard to stay in normal condo on our next visit. Your place spoiled us forever. Thanks to everyone for their kindness.